These white chocolate bars or bark if you prefer to call them like that, were made in the first week of February when we had planned a reunion of our classmates in Banaras. 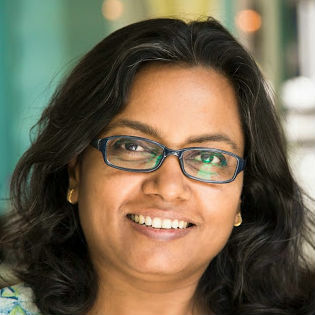 Now that both of us (Arvind and me) were classmates for our post grad, we were looking forward to it keenly. And since most of the other classmates follow my food and blog updates and keep nudging me teasingly to make them taste any of those, I decided to carry some edible gifts for all of them. I made a few fruit jams and marmalade, some cookies and these white chocolate bars with sun dried assorted fruits. Now there is nothing technical involved in making chocolate bars, or very little technicality to be honest, one can always get a good quality bar or pellets of any chocolate, melt it over double boiler or in microwave and set it again along with whatever one likes. Long ago I used to make white chocolate with a prominent minty taste, just because I did not like white chocolate and someone had gifted me a kilo of Callibout white chocolate couverture pellets. 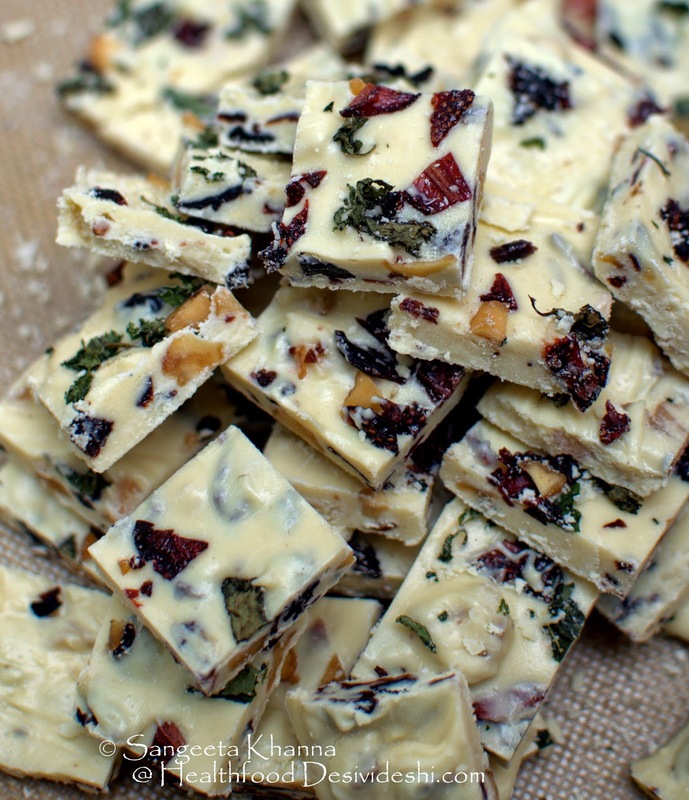 That mint infused white chocolate bark had changed my perception towards white chocolate as I made about 3-4 batches of the same till the chocolate lasted. 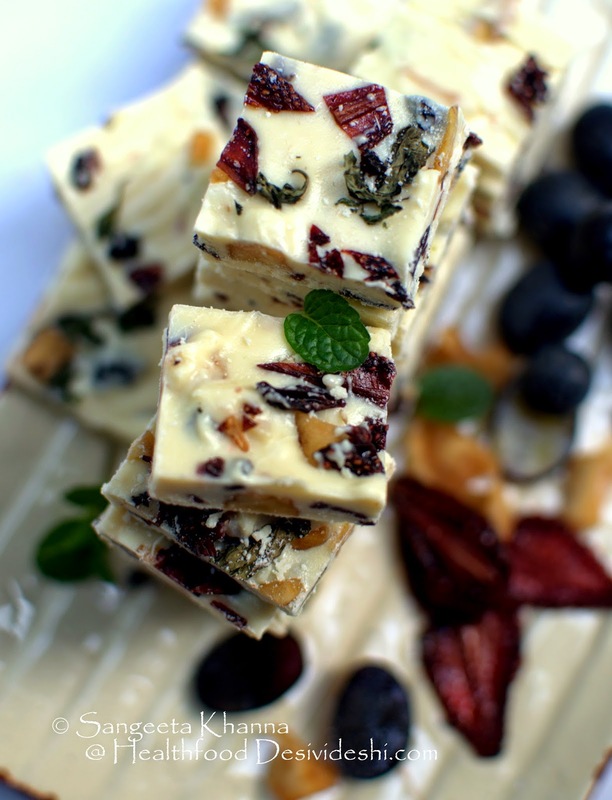 The idea of bringing colors to a white chocolate bar was there on my mind for quite long and I once tried such bars with mixed nuts and some prunes and cranberries from Del Monte. Yes I had started stocking white chocolate couverture after my tryst with the minty white. But it so happened that last year I sun dried so many fruits that I broke all my previous records of doing so. To make it clear I do not follow actual 'sun' drying procedure always but use low temperature oven dehydrating method mostly or a mix of the two processes to make the sun drying faster and better. 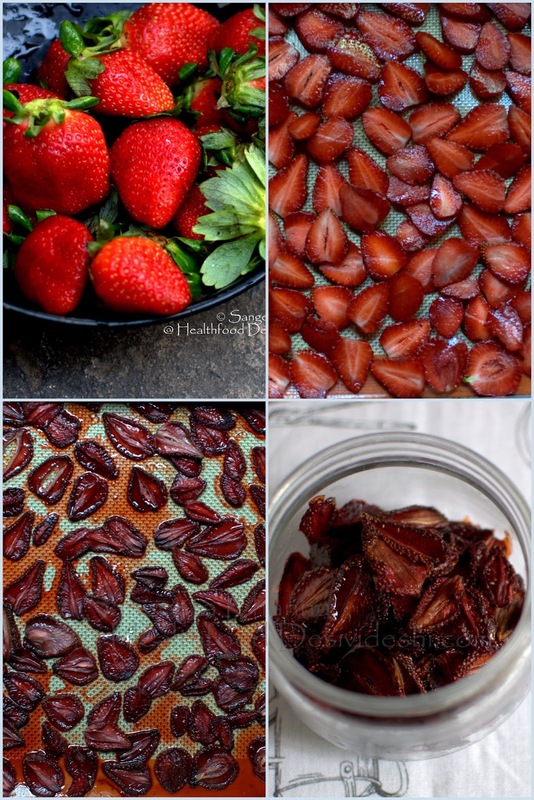 Here is the strawberries I dehydrated last year when I had bought too much from the outskirts of Dehradun while traveling there, I had no option to just dehydrate them. I am not regretting one bit. These perfectly chewy slivers of strawberries get so intense on flavours that you would feel like dehydrating more whenever you get a chance. The ones you get in stores is candied or 'sun dried and coated with glucose syrup' strawberries FYI. Better to make your own if you can. 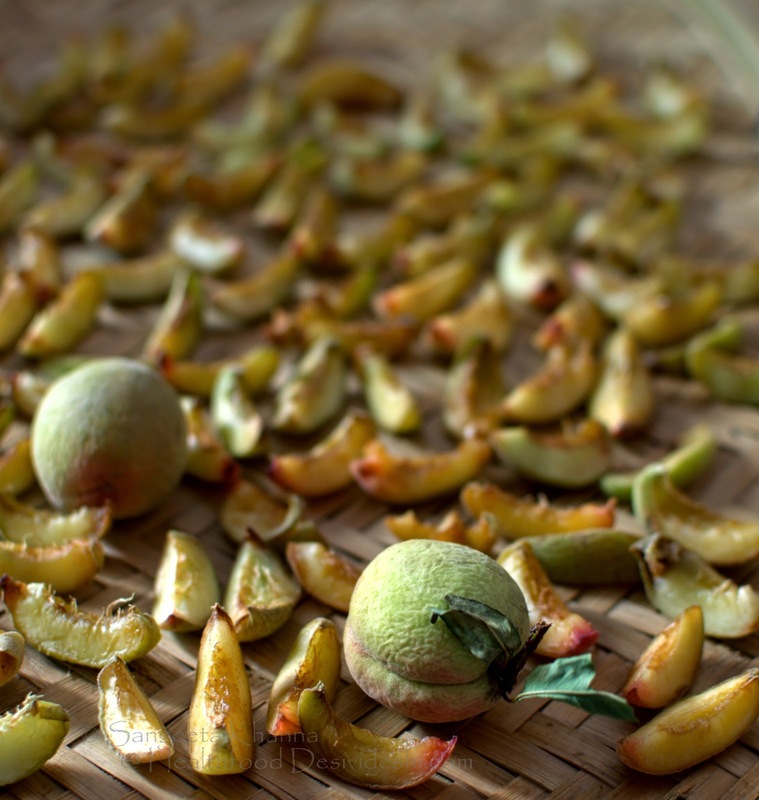 I even dehydrated peaches last year and those have been so good for snacking.. These were peaches from Mukteshwar, brought from my Te Aroha visits where I am currently working on the menu and training the kitchen team. These peaches had very nice sweet and sour taste and sun drying converted them into perfect bites of fruity indulgence. I dehydrated black grapes and apples too just to see how different the taste is from the glucose syrup coated ones. I was right in my assumption they would be better and will be rightly sweet and intensely flavoured. For these white chocolate bars I dug out all these jars of sun dried fruits and chopped them up. You can always use sun dried fruits from brands like FabIndia or Del Monte or others. And if you are making bigger batch of this you can follow the procedure of melting the chocolate in two batches. The way I did as I made double this recipe. To make a double boiler contraption in home kitchen you can take a saucepan or stockpot (pateela) and a deep bowl that fits the rim of the stockpot. Fill the stockpot half with water and let it come to boil. Place the deep mixing bowl over the boiling water stockpot and place the chocolate in the bowl to melt. Stir a few times to see if it is melting evenly. In the mean time line a baking tray with silpat. I used 2 baking trays of 9"X11" size.You can use any convenient size according to the thickness you want in these bars. 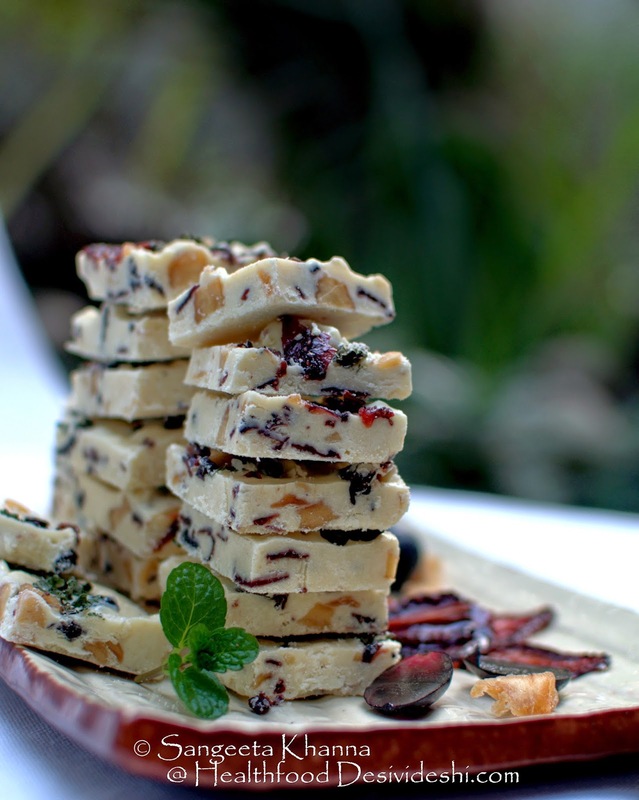 Chop all the dried fruits and half the mint crushed and mix with the white chocolate and incorporate everything together. Pour the melted mix onto the silpat lined baking trays, sprinkle the rest of the mint leaves over it and press a bit. Let the mixture cool completely before cutting bars with a sharp knife. These jewel studded bars of white chocolate will be loved by everyone who tastes them. I am planning to make them again as Arvind was cribbing he didn't get to taste last time. Never use chocolate compound to make such bars because chocolate compound has trans fats, all the cocoa butter in real chocolate gets replaced with trans fats when they process it to make the compound. Choose the best quality for your family, it will be great in taste and good for health too. 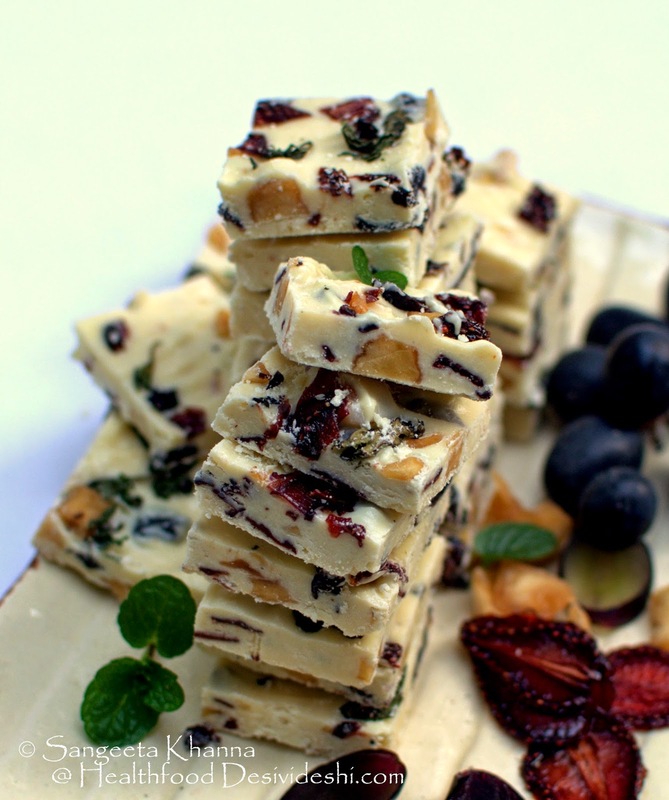 No extra sugar is added to these white chocolate bars, the sweetness of assorted fruits and the couverture is great together and a small bar of this treat will not hamper any health goals you are working towards. Wow, very innovative, loved the addition of home dried fruits, bookmarked. Oh my! You may just have converted a white chocolate "disliker" (is that a word?) into a white choc fan! I make these kind of bars/barks, but only with DARK chocolate. This got me drooling though…!